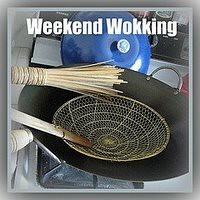 It's that time again: Weekend Wokking time! We knew we couldn't miss an edition of Weekend Wokking, and since the ingredient was CILANTRO (a favorite), we doubly couldn't miss this edition. It's a tough ingredient, for sure, for how does one make cilantro the star of a dish? It seems like our energy levels the past few weeks have been dipping considerably, and we seem to be "very busy" for unknown reasons, but we didn't want to just phone this one in. So, we thought something simple, yet something that's still a little unique, was in order. We present to you, Cilantro Horchata! Actually, I believe our first idea was a rice pudding, but we were even too lazy to make that. Oh, by the way, JS has just made a groundbreaking discovery as to our dipping level of energy. Ready for it? We've had the first season of Dexter on DVD for the longest time, purchased at Costco so long ago, and finally decided to watch it. We finished the season in three or four nights, staying up until only 2am or so. So, we decided to test fate. After discovering that Costco did not have Dexter for sale, I bought Season 2 via Amazon. We had about 5 days of rest before Season 2 arrived, and so were very cocky. We watched Season 2 in a mere two nights, staying awake until 4-ish (ok, 5-ish) in the morning. Holy, that took its toll! That was a week ago, and it seems the two of us are still paying for it. Age! The cilantro portion of this item comes in syrup form. I made simple syrup (equal parts sugar and water), and steeped cilantro stems from a few bunches of cilantro in it. After an overnight stay, they were strained out, leaving me this amber-y simple syrup. When one refers to "horchata" in North America, they usually refer to the Mexican rice-based horchata usually flavored with cinnamon. For Asians, think "rice milk". To make the horchata, I soaked some rice in water overnight. The next day, I buzzed the whole lot in a blender with more water until liquified. At first, I strained the mixture through a coffee filter, but found that it strained out all the rice sediment! It left me just water, more or less. So I simply strained everything through a fine sieve. The resulting drink was a tiniest bit gritty, and had to be stirred occasionally. Any tips on how to prevent the rice and the water from separating? Oh yes, that is our cilantro plant. Our garden is in a state of... non-growth, let's just say. Everybody's bolting in there! 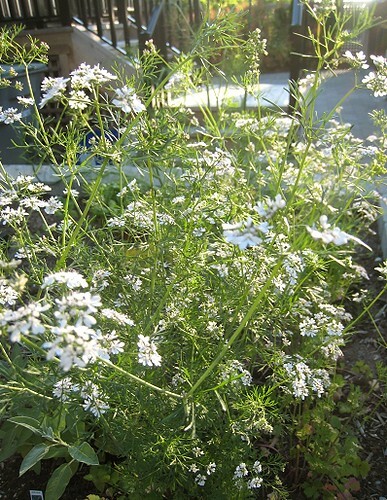 So yes, our cilantro plant is now flowering, not yielding any leaves for us to use at all. 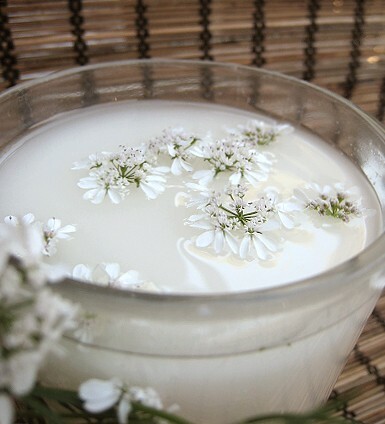 I used the flowers as garnish for our cilantro horchata. If Wandering Chopsticks and Darlene of Blazing Hot Wok (the host for this edition) will indulge us, we have one more cilantro entry for Weekend Wokking coming up (tomorrow's post)! update: Our second entry is posted! 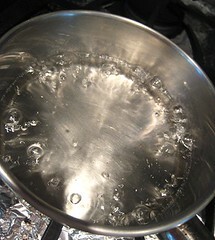 Make the cilantro syrup by simmering the sugar and water in a small saucepan until the sugar has completely dissolved. 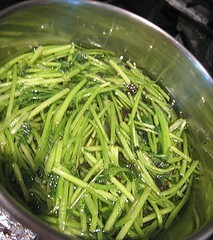 Add the cilantro stems to the syrup and steep, minimum 1 hour, or overnight. Strain out the stems and set syrup aside. For the horchata, soak the rice grains in the 1 1/2 cups of water overnight, covered. 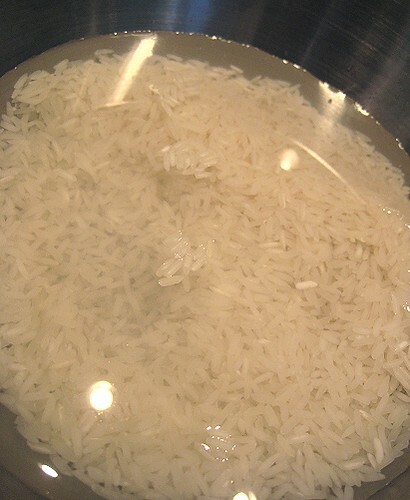 The next day, place soaked rice and liquid in a blender and process until very smooth/liquified. Add the additional 4 cups of water. Strain though a fine sieve while chilling in the refrigerator. Stir well before serving. 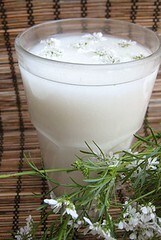 Individuals can add cilantro syrup to taste, or simply mix together the syrup and horchata in a pitcher and serve. We're submitting this recipe to Weekend Wokking, a world-wide food blogging event created by Wandering Chopsticks celebrating the multiple ways we can cook one ingredient. The host this month is Darlene of Blazing Hot Wok. If you would like to participate or to see the secret ingredient, check who's hosting next month. Check out all Weekend Wokking Roundups. This looks wonderful, a great idea, if I ever get my hands on that much cilantro! I've heard that the flowers pervent the leaves from growing, so you should get more leaves soon. But I've never been able to grow cilantro for more than a week. Its like a horchata and a spicy lassi had a baby. This is such a great idea - and quite clever too! This sounds so unique to me but elegant. How come you ladies are always so inventive? I looove the idea of a cilantro horchata! Oh, and I can't wait to see what else you come up with regards to cilantro. I know what you mean about being lazy though. Gotta do my own entry! This is a really interesting, creative idea. I'd never heard of a cilantro horchata before. 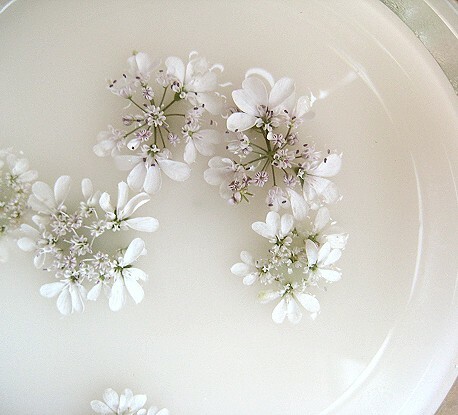 Great idea to garnish with the cilantro flowers, it looks beautiful! 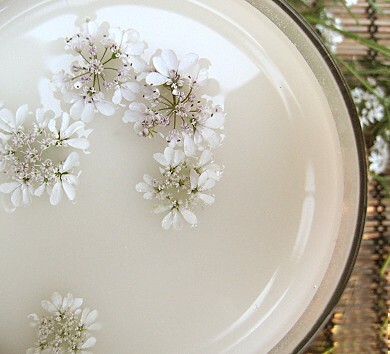 The flowers on the drink look beautiful! 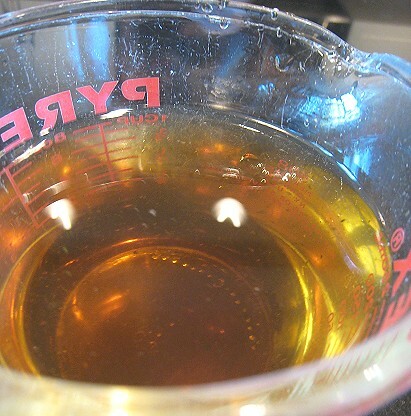 As for the separation of the liquid, that is as expected. I don't recall ever seeing the drink without that "effect". Our plants have bolted... Will probably get seeds soon, although I've never tried getting seeds from a fresh plant before. Haha... it's their love child. Gotta warn people about it eing an acquired tast, though. Hehe. =) Or, its "controversial" taste (as you put it). Thank you! Since our cilantro plant didn't really give us much leaves, I thought it might as well provide some other use! Oh, OK... so there's no magic trick to stabilize the drink. Good, it's not an "epic fail"! oh my, the drink is so beautiful. nice photography. I am so envious of your blooming cilantro plant! I know a few people who hate cilantro but I really like its taste. Sounds like a natural addition to horchata. Cilantro is the best! I have to fight the urge to try and convert cilantro-haters. Never seen cilantro flowers, they're just adorable! can't add much more then what's been said already--ingenious and great use of all the ingredients! I never know that cilantro flowers are so pretty! great post! Thanks for the info! Man, I knew we needed some sort of specialized equipment for this! Hehe... Although, if I'm not mistaken, I think there are perhaps some home grinders available... I just don't know from where!